Just last month, Jon and I were contemplating taking the month of June off and dropping in on my dad, who spends half his time in Beijing in his retirement. We would backpack through Beijing, Shanghai, Xi’an, Guangzhou and maybe visit some long-lost friends in Hong Kong. However, my dad was coming back to New York three weeks early, and he said tourists were having a heck of a time trying to prove they didn’t have the Swine Flu upon arrival and were being quarantined in a hotel for at least a week. So we opted out. The Swine Flu paranoia is still lingering around China’s airports, but if you are willing to take that chance, SmarTours is offering an incredibly Economy-Friendly 10-day package to Beijing and Shanghai. For $799 (not including taxes), you get a roundtrip flight from the west coast ($100 more from New York), a flight from Beijing to Shanghai, upscale hotels and English tour guide… for $799!! The cost of a plane ticket to China and back is usually at least that amount, if not more (right now, it’s about $1,000+). And if you’re not into being herded around on a tour, you can also opt to break your own path out. I have been to China since the 70’s, when Americans rarely went, and it’s been incredible watching the transition from gray-and-navy Mao costumes, to regular dorky FOB-wear (and I was the “cool” American-born Chinese relative visiting) to the uber-fashionable luxury design labels, whether real or counterfeit (and now I am a fashion embarassment to my relatives). People often have mixed reviews of China, particularly of Beijing, but I just love going back every time. People in China drive like suicidal maniacs, they can’t patiently stand in straight queue, they snort and hock lugies on the sidewalk or in porcelain spittoons situated around the sidewalks for this purpose (my mom used to forbid us to look inside), they karaoke during dinner, and they fight like wrestlers over who gets to pay the restaurant bill (it’s mostly amusing to watch this erupt at every single table). The polluted air does leave the inside of your nose entirely black by day’s end, I also feel like a giant trying to shop for women’s clothes there. But throw in its thousands of years of history; the giant temples and pagodas and curved roofs; the massive Great Wall snaking along the mountaintops; people squatting on the sidewalks selling vegetables, fresh fish, vegetables, jade, paper cuttings; the smells of scallion pancakes and yams cooking in the streets; the thousands of people racing down streets on rickety bicycles; the dirt-cheap prices; and the morning calm as older people gracefully flow through their T’ai-chi practice; and you’ll see why I love going back. It’s not wonder China is determined to reclaims its title as the Middle Kingdom once again. For $799, it’s well worth it. Last week I realized it was past mid-June and besides reserving our flight to Sweden, we hadn’t made any other reservations. Sure, we could just wing it once we land, but we have only one week in Sweden (after 4 days in London) and I have wung it (winged it? wung?) through Europe in the summer before only to spend half a day looking for a place to stay, which can be exhausting for my hands with all the sign language. So, like all other trips, I cracked out the spreadsheet and started planning out our itinerary. 1. Despite that most Swedish tourism Web sites have an English version, every once in a while a Web site will pop out with little boxes in Swedish. There are oomlats (the two dots), single dots like little circles over letters, and o’s with slashes through them and it’s all very confusing, and not a language you can even try to guess (although I figured out that “boka hare” means “book here”). In addition, it takes too long to replicate on an English keyboard, so sometimes the boka engine has difficulty figuring out where I am trying to go. 2. There is Gotland (the island we’d like to visit), Western Gotaland (a portion of Sweden), and Eastern Gotaland. Then there’s also Gothenburg, which is also called Goteburg (with oomlats over the “o”), which is also called Gotenborg (picture of this three-named city, above). 3. Once you’re on the west coast of Sweden, you become very tempted to step over to the fjords of Norway (3 hours north!) or Copenhagen (3 hours south! )(picture, right). The next thing you know, you are trying to read Danish or Norwegian, where it is actually Kopenhamn. And just as you became acclimated to dividing your SEKs (Swedish Kroners) by 7.8 to get a price in dollars, you have to start in with Danish and Norwegian currencies. In addition, you start reading more about Side Trips from Copenhagen that all sound so fascinating that you want to take advantage – I mean, how often does one get to Scandanavia? The next thing you know, you’re trying to fly everywhere or take night trains to maximize your time and deprive yourself of sleep. 4. There are many resources for Sweden, but not every book mentions them, and it becomes quite a scavenger hunt to pull all the information together. So here are my resources. Josie’s and Steve’s wedding Web site. Yes, these are my friends whose wedding is taking place in Gothenburg/Gotenborg/Goteborg. 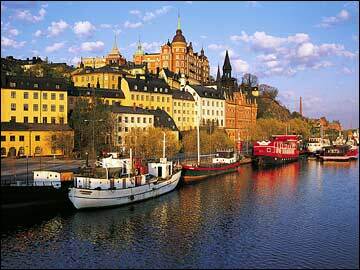 Josie, who is Swedish and from Gothenburg/Gotenborg/Goteborg, has listed some great ideas for places to travel. She also gave me opinions of different areas of Sweden, so it boils down to if you have a week, stick to the coasts (kind of like the United States, with exception to the Grand Canyon). Airlines: SAS, Skyways, CityAirline, Malmo Aviation, and Norweigan Air will take you around Sweden and neighboring countries. Train: The SJ has the high-speed X2000 that takes you across Sweden in 3 hours. Fares tend to come down as you get closer to the date, but don’t wait until it sells out, particularly on weekends. Ferry to Gotland: This site (Destination Gotland) gives timetables, including from when the bus picks up in Stockholm to when it arrives in Visby. The ferry also departs from Oskarshamn, towards southeastern Sweden. It is a four-hour commitment, so consider flying as an alternative. Skyways flies Stockholm to Visby regularly, and CityAirline flies from Gothenburg to Visby. Jon and I happen to be in Gotland during the Medieval Week, when the UNESCO site of the Medieval walled city goes back in time with jousting, hurdy-gurdy playing, jesters, musicians, scribes, lamb feasts, merchants in a market, a medieval pub, and a re-enactment of “how the rich citizens become destitute when the king of Denmark forces them to submit while threatening to burn their beautiful city.” I can’t wait! Stockholm airport transfers: You can take a fast train, shuttle bus or taxi from any of Stockholm’s airports into the city center. There are also transfers between Arlanda and Bromma. It’s a 40 minute bus ride, or a 20 minute train ride. Swedish Lapland. I’m very sad that we won’t have enough time to venture above the Arctic Circle and witness the midnight sun, maybe play a round of very expensive golf at 1 in the morning, go dog-sledding and camp out in the wilderness among reindeer and eat mysterious cloudberries that have been talked about in various guides to Lapland. Burgundy is almost a cliche, but it is a great one. Taking a wine tour through that area of France, only a couple hours’ drive from Paris, is really as remarkable as it sounds. While Parisians were turning their tunnels into catacombs filled with skeletons, Burgundians transformed theirs into wine cellars. Rustic family-owned wineries, French words ringing in your ears, the lack of pretention that Napa sometimes harbors and the lack of stretch Hummers carting sorority or bachelorette parties around or references to Sideways, well, you can’t get much more picture-perfect than that. If you’ve already ventured around the Parisian sites and have a few days to spare, rent a car and head out of town. Jon and I ventured with a couple Czech friends, Michel and Klara (picture above, in Troyes), for a trip to Burgundy one lovely fall weekend. Jon and I first took the TGV from Paris to Reims, the capital of Champagne, to taste some true Champagne (because it’s not only sparkling wine if it’s not made in Champagne – those snooty French). Our friends picked us up in Reims and we continued through the vineyards and picturesque French countryside, complete with sheep and roadside barrels, through Troyes, then through Dijon, down to Beaune, capital city of Burgundy. We stayed at someone’s chateau/ two-bedroom bed& breakfast: Chateau Georges, a quaint and adorable private chateau built in the 1500’s that fits the brochure image of a French weekend for Americans (photo, right). The owner was a quiet man who spoke no English, with a daughter studying abroad in Washington, D.C. and a wife-doctor in Paris. He would quietly shuffle around preparing incredible breakfast spreads for us and waiting patiently for us to get out of bed to serve us. He had a cellar full of wine, which we could probably look at but we didn’t. Now the more challenging part of the wine trip is designating a driver. Since it was Michel’s car, he ended up driving, though he snagged dips here and there. The highlight was Marche aux Vins, a one-stop shop for wines. Situated in the bustling winemaking center of Beaune, the expansive Marche aux Vins is one of the largest wine tasting cellars in the area. For 10 euros, visitors get a tasting dish and map to nearly 25 different bottles. Tasters descend into the cool, candlelit underground lined with dusty bottles and barrels to sample the region’s recent vintages. The upstairs houses the Grand Crus, with sommeliers lurking over shoulders to ensure tasters don’t double-pour on the expensive bottles. We’d also stopped along several other wineries on the road which all led us into their dusty cool cellars filled with barrels and poured us sumptuous tastings. The thing about wine is it truly helps your foreign language skills. By the end of the day, Michel and I were chatting away in French to everyone around us whether they knew what we were talking about or not. Our favorite was Domaine Gaston et Pierre Ravaut. I don’t believe it was customary, but we ended up on a long tour through the cellar with Pierre dipping a turkey baster into different vats to let us compare a wine that had been sitting for, say, three months, versus one sitting for longer. It is possible that our chatty French questions may have illustrated interest and thus the grand tour. Of course, no trip to Burgundy would be complete without an obligatory stop for beef burgundy (or boeuf bourgogne) and escargot, another specialty of the area. Ooh, la la. This past weekend Jon and I were heading out to Shenandoah National Park for a night of camping at Low Water Bridge Campground and hiking Old Rag, a popular and strenous hike to one of the prettiest peaks in Virginia. I spent the past few days beforehand preparing for our getaway – lugging out the brand-new wedding tent, sleeping bags, foam mats, propane lantern, headlamps, bug spray, food, etc. etc. On the morning of our departure, I was checking through our packing list to make sure we had toothbrushes, hiking boots, first aid kit, towels, ketchup, aluminum foil – check, check, and check. We grabbed as many items as our arms and hands could carry and loaded them into the trunk of my car. Of course, for all my carefully made lists and checking, what did we leave behind? MY BAG. Well, I had carefully packed my hiking shoes, first aid kit, headlamps, towels, change of clothes and a bunch of other essentials in that duffel bag. The bag itself just didn’t make it with us. Jon insisted it was my fault – how could I not keep track of my own bag? I argued that it was his fault – I was busy keeping track of every other bag and piece of equipment that came on the trip, and my bag was sitting right next to HIS bag, was it so hard to take mine with his since he apparently was only tracking one bag and I was tracking 20? There I was, trying to get a campfire started with a pile of wet wood from the torrential downpour that started the precise minute we stepped into the campground office, fanning two fires at the same time (campfire and my internal rage). Regardless who was at fault, Jon has basically learned never to leave my bag behind, ever. So, lessons learned about packing lists in general and how to avoid angry wife handling fire because neither of you thought to check if her bag was in the car. 1. Keep a list of all your basic essentials that go with you on every trip, and laminate it or put it somewhere where it won’t get lost. For example, the morning of a trip, I am always scrambling to grab things that couldn’t be packed ahead of time: glasses, phone charger, phone, camera battery, allergy meds. 2. Keep your toiletries separate from your regular bathroom items and take inventory after each trip. Is there a full tube of 3oz toothpaste? Is that lotion or shampoo in the unlabeled bottle? Is your saline solution topped off? This way, you won’t have to spend any time before a trip trying to remember items and won’t end up washing your hair with body lotion. 3. For trips involving a lot of baggage (like camping or skiing), make a list of all the items AND the bags. I was pretty peeved that my hiking shoes stayed home since there was no way I could take my FitFlops hiking, even if they are designed for fitness. 4. Keep these lists in a folder with your passport and other travel documents, or e-mail it to yourself. This way you won’t have to re-brainstorm them every single time while risking the chance of leaving an item off. If Scrabble allowed you to use proper names, Qantas would be a great use for the letter Q without the U. And today, Qantas has found even more new uses for its name to splatter across headlines: Flights to Australia starting at $229 one way from the U.S.
Talk about some great promotional marketing. This is very much like the ploy of the Queensland Tourism Bureau for the Best Job In The World that even I fell for – draw billions of people to look at the Qantas site and just consider maybe, for a moment, of jetting off to visit some kangeroos and koalas. I am always skeptical of such deals, partly because they require you to depart on random days and random hours, which doesn’t matter much to unemployed me but more to working you. Also, you have to mentally tack on about $100 in taxes one-way, and then another $100 for flying from the east coast. So, in reality, these $229 tickets are really starting around $429. Under ordinary economic stances, you can’t ever get a flight to Australia for below $2,000 roundtrip. Not that I would even know, since I’ve never shopped for a flight to Australia. However, I thought why not, this might be a good opportunity to visit my dear friend and former roommate Kit, a native Chicagoan who found himself writing for a magazine out in Sydney but may be departing on a tour of Asia before returning stateside this autumn. Flights are always more reasonable out of JFK, so I would have to drive up to my dad’s house and then wrangle a ride to the airport out of him. So I entered JFK to Sydney, flexible dates (because you can’t be picky when there’s a good deal). And while the flights appearing are not in the $200’s, as I suspected, they are incredibly low: $460 one-way from JFK to Sydney leaving on August 4, returning August 23 for $521. Total = $968 roundtrip, including taxes and fees. If you’re a Californian, you might be able to score even lower. (You can’t just fly to Australia for the weekend, although I did meet a government contractor from New York on a plane once who was sent to Australia for two days to work on the electrical engineering of a military ship.) Now that is an incredible, incredible deal that you have to thank subprime mortgages for. Note: it is “winter” over there but it is Australia. I’d be on a plane if 1. my sister wasn’t giving birth next month and 2. my friends weren’t getting married in Sweden. Sweden, Australia, baby niece/ nephew. Oh, priorities! I finally went out to see a movie for the first time since I saw Batman last summer. It’s not that we haven’t had any interest, but I suppose we have less interest in trying to find a parking spot in Georgetown on a Saturday night. So what great cinematic work of art drew us out to the theater for the first time in a year? Well, it was Angels & Demons. I can’t say it was an Academy Award winner by any means, but I was well-entertained. The part that I enjoyed the most was watching Tom Hanks run through the great Italian city of Rome, and sitting next to Jon going “ooh! There’s that piazza! And that piazza! And that church! We were there! And there! And there too!” I was also glad we had gone to Rome before the movie, so we wouldn’t be in Rome with a bunch of American tourists pointing at a church going “Hey, that’s the church that was in Angels & Demons” the way they did all over Paris with The Da Vinci Code. I have now had the great opportunity of going to Rome twice in the past five years. The first time was in the summer of 2004, a one-day trip with my friend Janice. We arrived at night by train from Florence and stayed up until 3am wandering the streets. I remember two things distinctly about that night: 1. It was alive and happening, almost like it was daytime, but the sun was replaced by a full moon. Outdoor cafes were crowded with people sipping wine and coffee, eating cheese or gelato or other delicious Italian treats. Bars and clubs were booming, people were window-shopping, tourists were sitting on the Spanish steps and in front of the Trevi Fountain taking pictures. 2. Every street and corner we turned, there was something different and interesting to look at. A sculpture, a statue, a church, a fountain, a picture of Mary. We didn’t even try to take a taxi back to our hotel near the train station – we just walked and took it all in. The second time was in the fall of 2007, when I was living abroad in Paris. Jon and I took two weeks off to wander through Italy – quite a luxury for Americans, having two weeks – and spent four rainy days in Rome. We wanted to buy a clear umbrella so we could see the tops of the Coliseum without it blocking our view, but couldn’t find one. Your guidebook will explain how to do Rome properly. My version will tell you the same, with personal opinions interjected. The Vatican. You can’t go to Rome without stopping to see the wealthiest religious state in the world. It was closed the first time I was in Rome, so it is essential to check its opening hours on the Web for the most up-to-date information. Very Important: Get there EARLY, before it opens, so you can wait on the giant line to get in. Even on a random weekday in November. Within the Vatican, each room becomes more and more ornate as you proceed towards the Sistine Chapel – the last room. There are halls covered in gold-framed paintings with so much action and detail in each one that you really need a few hours and a stretcher upon which to lie and stare upright. The Sistine Chapel has a recorded message reminding you not to take pictures – but alas, nobody pays attention and flashes bounce off everywhere. Be good by turning off your flash if you do take photos. If you like to send postcards, you can do so from the Vatican Post Office. It will stamp it with a Vatican stamp, since it is its own country. St. Peter’s Basilica. You can catch the Pope giving a Sunday mass outside with giant screens, but then you can’t go inside the cathedral until afterwards. You’ll be asked to cover up your shoulders, and you’ll be scolded by Catholics for baring any part of your shoulders while climbing the many stairs to the cupola even if it is 100 degrees out. Also be impressed by the Japanese tourists hiking up the stairs in high-heeled stilettos. I didn’t ascend to the top last time because we had exactly 7 euros left and no ATMs nearby – exactly enough for one person’s admission upstairs, so Jon went (be sure to carry enough cash with you). There is so much to take in at St. Peter’s, like the jester outfits on the Swiss Guard and staring at Michaelangelo’s La Pieta wondering how is it that Mary is able to hold a grown adult Jesus in her giant lap without her lap looking so giant? Only the gift of a true artist can trick the eye like that. Roman Forum. We waited out the rain for a sunnier day so we wouldn’t go trapsing through the mud around the Forum. It’s really a good idea to get an audioguide to walk you through each area, or else everything will just look like piles of rocks. Coliseum. This is the first time I will recommend seeing a movie before going on vacation (I really hate thinking that something is because it appeared in a movie, kind of like when people attribute classical music to TV commercials. i.e. Gershwin’s Rhapsody in Blue is NOT the “United Airlines song”). Watch Gladiator with Russell Crowe as our representing ancient Roman to get a really great vision back in time to when Rome was at the height of civilization. Trevi Fountain, Spanish Steps and Piazza Navona. These are best enjoyed with a double gelato in hand. 1. Check the prices and be very clear the quantities you order in a restaurant. In touristy areas, they will rip you off. For example: 2 “large” teas (large = larger pot of boiling water) cost us 12 euros each, or 24 euros, or nearly $40. Wine was 3 euros. Another example: we ordered what we thought was one appetizer of a giant warmed mozzarella with salamis surrounding it, but waitress brought us two because we “never specified only one”. We managed to argue it off our bill. 2. Most inexpensive hotels are by the train station, and it is then very easy for you to get in and out of Rome if traveling by train. The area is, for the most part, safe, but do be aware of your surroundings. People will pickpocket. We stayed at the Papa Germano Hotel, a quaint 2-star hotel that was clean, quiet and inexpensive. It was across the street from a Chinese restaurant and rooms came with a TV, ensuite bathroom, Internet downstairs and breakfast included. 4. Great souvenir: The “hot priests” pinup calendar (also available online). It is exceedingly disturbing and I’m not sure if the proceeds go back to the church or to some clever entrepreneur’s pocket. It is a 12-month calendar featuring some handsome young vicar staring at you on each month. Alternatively, you can also get the Pope calendar, but it’s less controversial and less interesting and then you just have a calendar with the Pope on it every month. 5. If you want to see a movie, note that Italy has the number one best voice-dubbing in the world. It even has people specially trained to sound like Tom Cruise or Julia Roberts, but in Italian. Most movies will then end up being in Italian, so check with the theater ahead for movies in English. 6. Definitely dine here: Da Giggetto, of Roman/ Jewish cuisine, in the Jewish Ghetto (Via del Portico d’Ottavia 21-22). Order the fried artichokes. 7. Lastly, you should really see Rome by foot. Ancient Romans did, unless they had horses, and it is the best way to discover so much on every street corner. Take an umbrella with you in case of rain.